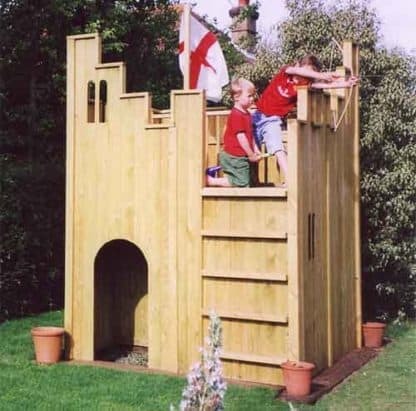 The All Out Play Fort is a compact version of the Castle which has an internal platform and swing bars, 3 arched doorways, arrow slit windows, 2 ladders and a flag pole. Access to the upper platform is by internal and external wall mounted steps. A slide or Bridge can be added to the upper platform. A Flag is not included, it is available to purchase separately. 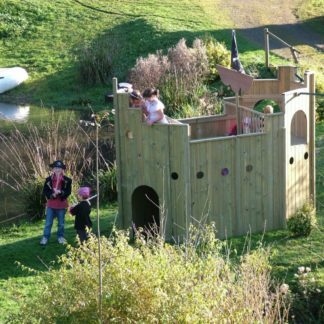 The All Out Play Fort is craftsman built from 15mm tongue and groove, non-toxic pressure treated premium grade Redwood Pine timber throughout which is only sourced from fully managed, renewable plantations. All fixings are stainless steel or coated to prevent rust and corrosion, and all bolts are domed and/or countersunk for safer play. 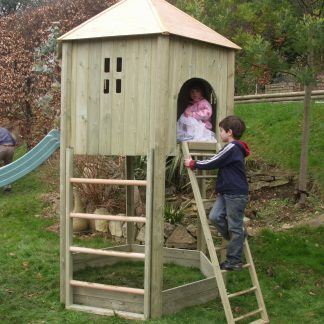 Assembly: 2 adults x 2 – 4 hours. Children’s outdoor play equipment should be sited on a well-drained, level, impact reducing surface. A ground anchor set is available for exposed locations.